Some volcanic eruptions are thousands, or even a million times more explosive than others. 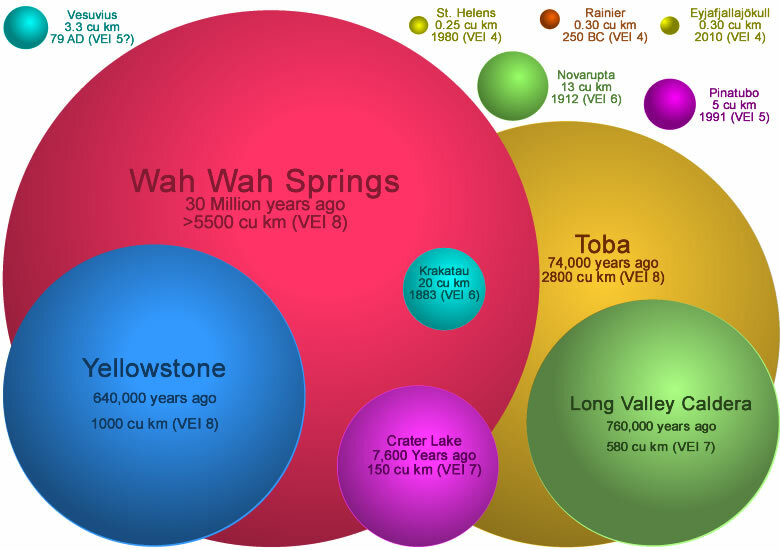 Volcanic explosivity index: The spheres in the illustration above represent the volume of erupted tephra for some of the most widely-known explosive volcanic eruptions. Although most people believe that Vesuvius (79 AD - the Pompeii eruption), Mount St. Helens (1980), and Mount Pinatubo (1991) were enormous, they are very small compared to ancient eruptions such as Wah Wah Springs, Toba, Yellowstone, or Long Valley Caldera. Volcanic Explosivity Index: The volcanic explosivity index is based upon the volume of tephra produced during an eruption. The spheres in this diagram give a relative size comparison for each step of the index. Measuring the size or strength of natural events has always been a challenge for natural scientists. They developed the Richter Magnitude scale to estimate the amount of energy released by an earthquake, the Saffir-Simpson scale to estimate a hurricane's potential, and the Fujita scale for rating the intensity of hurricanes. These scales are valuable for comparing different events and for understanding the amount of damage that events of different size can cause. Measuring the strength of a volcanic eruption is more challenging than collecting wind speed data or measuring ground motion with an instrument. Volcanic eruptions produce different types of products, have different durations and develop in different ways. There is also a problem that some eruptions are explosive (rock materials are blasted from the vent), while other eruptions are effusive (molten rock flows from the vent). Redoubt eruption: Eruption cloud from Redoubt Volcano as viewed from the Kenai Peninsula. This eruption lasted from December 14, 1989 until June 20, 1990. It was only a VEI 3. Toba was about 10,000 times more explosive. Photograph by R. Clucas, April 21, 1990. USGS image. Enlarge. More information. Chris Newhall of the United States Geological Survey and Stephen Self of the University of Hawaii developed the Volcanic Explosivity Index (VEI) in 1982. It is a relative scale that enables explosive volcanic eruptions to be compared with one another. It is very valuable because it can be used for both recent eruptions that scientists have witnessed and historic eruptions that happened thousands to millions of years ago. The primary eruption characteristic used to determine the volcanic explosivity index is the volume of pyroclastic material ejected by the volcano. Pyroclastic material includes volcanic ash, tephra, pyroclastic flows, and other types of ejecta. The height of the eruption column and the duration of the eruption are also considered in assigning a VEI level to an eruption. Wah Wah Springs: Eric Christiansen and Myron Best of Brigham Young University explain the evidence that supports the Wah Wah Springs eruption as one of the largest, if not the largest, explosive volcanic eruptions known. 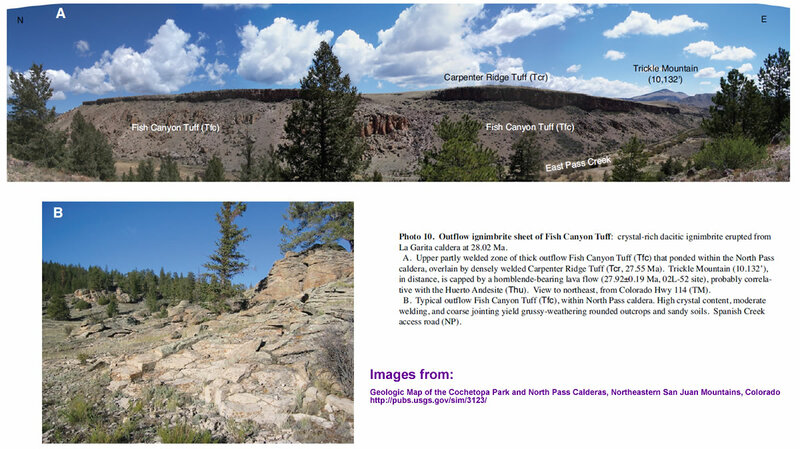 Fish Canyon Tuff: Another VEI 8 eruption that rivals Wah Wah Springs occurred about 28 million years ago in what is now southwestern Colorado. 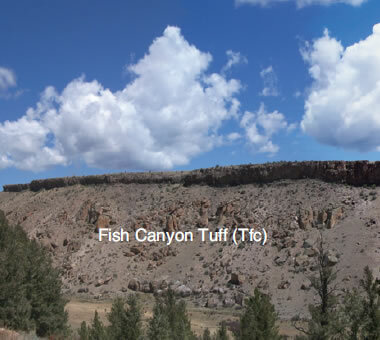 The eruption at La Garita Caldera produced the Fish Canyon Tuff, a dacitic ignimbrite, with an original estimated volume of about 5,000 cubic kilometers! Image by USGS. Enlarge / image source. The VEI scale begins at 0 for eruptions that produce less than 0.0001 cubic kilometer of ejecta. Most of these eruptions are very small in size. However, some of them are "effusive" rather than being "explosive." Effusive eruptions are characterized by lava flowing from the vent instead of ejecta being blasted from the vent. Eruptions rated at VEI 1 produce between 0.0001 and 0.001 cubic kilometers of ejecta. Above VEI 1, the scale becomes logarithmic, meaning that each step in the scale represents a 10X increase in the amount of material ejected. VEI 2 eruptions produce between 0.001 and 0.01 cubic kilometers of ejecta. VEI 3 eruptions produce between 0.01 and 0.1 cubic kilometers of ejecta. The progression of the scale from VEI 0 to VEI 8 is shown in the diagram on this page. With each step in the scale representing an explosivity increase of 10X, a VEI 5 is roughly ten times more explosive than a VEI 4. Two steps of the scale is an increase of 100X in explosivity. For example, a VEI 6 is roughly 100 times more explosive than a VEI 4. A VEI 8 is one million times more explosive than a VEI 2. All of this is based upon ejecta volume. Because each step of the scale is a 10X increase in material ejected, there is an enormous difference in the size of an eruption on the low end of a step and an eruption on the high end of a step. For this reason, a "+" is often added to eruptions that are known to be on the upper end of their step. For example, the eruption of Katla in Southern Iceland on October 12, 1918 was rated at VEI 4+ because the eruption was a very strong VEI 4. 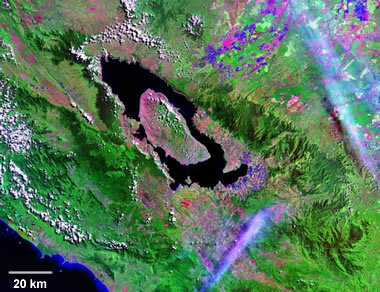 Toba Eruption Site: About 73,000 years ago, a volcano known as "Toba" erupted on the island of Sumatra, Indonesia. It was one of the largest volcanic eruptions that can be documented with current evidence. The blast is believed to have deforested parts of India - about 3000 miles away - and ejected about 2600 cubic kilometers of volcanic debris. Today the crater is the world's largest volcanic lake - about 100 kilometers long and 35 kilometers wide. Image composed using Landsat Geocover 2000 data from NASA. What Eruption Has the Highest VEI? About fifty eruptions have been rated VEI 8 because they are thought to have produced an amazing 1,000 cubic kilometers or more of ejecta. This would be a mass of uncompacted ejecta ten kilometers in length, ten kilometers in width and ten kilometers deep. Eruptions at Toba (74,000 years ago), Yellowstone (640,000 years ago), and Lake Taupo (26,500 years ago) are three of the 47 VEI 8 sites that have been identified. The VEI 8 eruption with the greatest volume of ejecta known is the Wah Wah Springs eruption that occurred in what is now the state of Utah, about 30 million years ago. It is estimated to have produced over 5500 cubic kilometers of ejecta in about a week. Eruption(s) at the Paraná and Etendeka traps igneous province had an eruptive volume of over 2.6 million cubic kilometers. However, these are thought to be effusive eruptions producing fluid basalt lava rather than explosive eruptions producing ejecta. The Paraná and Etendeka eruption(s) occurred about 128 to 138 million years ago. Their lava flows span from eastern Brazil onto the western portions of Namibia and Angola. They occurred when Africa and South America were connected. 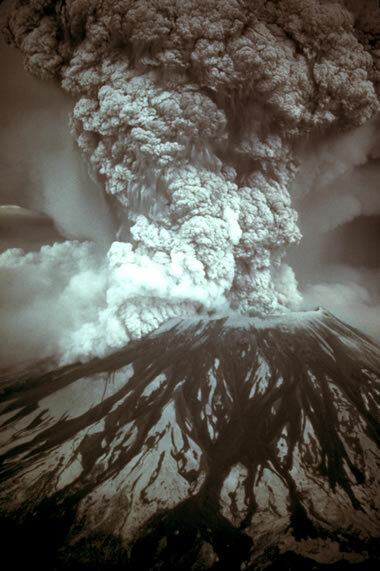 Mount St. Helens eruption: The May 18, 1980 eruption at Mount St. Helens was considered by most people to be an enormous eruption. The blast removed the top 400 meters of the mountain, produced a debris avalanche that covered 62 square kilometers, and knocked down trees over an area of about 600 square kilometers. This eruption was a VEI 4. Toba, at a VEI 8, was approximately 10,000 times as explosive. Image by USGS. As with most natural events, small volcanic eruptions are very common, and large eruptions are very rare. The data at left from the United States Geological Survey summarizes the relative frequency of eruptions of various VEI ratings. It clearly shows the rarity of high VEI eruptions - but demonstrates that they are possible events. The bar graph on this page summarizes the frequency of eruptions with various VEI ratings using data from the Global Volcanism Program of the Smithsonian Institution for eruptions that occurred between about 10,000 years ago and 1994. Only four eruptions of VEI 7 have been documented, but over three thousand VEI 2 events have occurred. Fortunately, very large eruptions are very rare events. VEI vs. eruption frequency: This chart shows how small, less explosive eruptions are much more frequent than large eruptions. The data used to prepare the chart is from the Global Volcanism Program database of the Smithsonian Institution. This database includes recorded and historic eruptions that occurred between about 10,000 years ago and 1994. When an explosive eruption occurs, the ejecta is spread by the force of the blast and by the wind. It is typically thickest near the source and decreases in thickness with distance. With present-day eruptions, observers can compile ash thickness reports from many different locations and create a contour map of ash thickness. This data can be used to estimate the volume of ejecta. Accurate estimates become more difficult when the eruption occurs in a remote area and very difficult when the eruption occurs on an island that is a great distance from other islands or land masses. In these situations, the size of the eruption cloud and the duration of the eruption can be combined with ash deposit data to assign a VEI rating. Similar estimation problems occur in calculating ejecta volumes for ancient eruptions. Ejecta is easily eroded and often covered by younger materials. In these situations, "best estimates" must be made. When assigning a VEI number is difficult, a question mark is often added to the number to indicate uncertainty. For example, the Global Volcanism Project lists the VEI of the October 24, 79 AD eruption of Italy's Vesuvius as "5?" because insufficient data is available to be certain about the number. Supervolcano eruption - in Sumatra - deforested India 73,000 years ago: Press release published online by the University of Illinois at Urbana-Champaign, November 2009. Questions About Supervolcanoes: Yellowstone Volcano Observatory, United States Geological Survey, last accessed August 2016. The Fish Canyon magma body, San Juan volcanic field, Colorado: Rejuvenation and eruption of an upper-crustal batholith: O. Bachmann, M.A. Dungan, and P.W. Lipman, Journal of Petrology, Volume 43, pages 1469-1503, 2002. Global Volcanism Program: A tabulation of volcanic eruption data that includes VEI ratings and eruptive volumes for thousands of worldwide volcanoes. Smithsonian Institution, National Museum of Natural History, last accessed August 2016. Supervolcanoes discovered in Utah by BYU geologists: Cara Caldwell, press release from Brigham Young University, December 8, 2013. Why Does the Scale Stop at VEI 8? The largest explosive eruptions that have been documented to date have been rated at VEI 8. Could eruptions larger than Toba, Yellowstone, and other VEI 8 events occur? Does Earth have the ability to produce a blast capable of launching the 10,000 cubic kilometers of ejecta needed to rate a VEI 9 eruption?